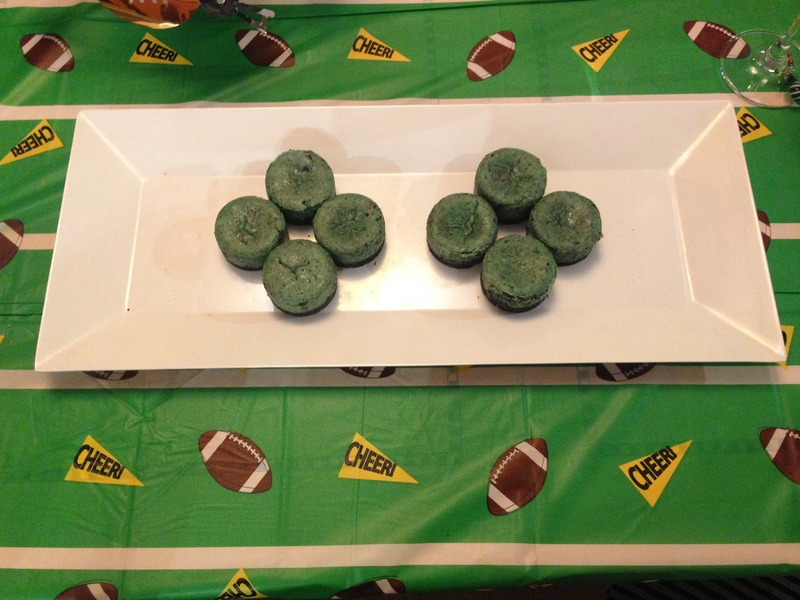 Just a quick post today to share the dessert I made for a superbowl party I attended yesterday. I was so excited to get to use my new mini cheesecake pan that I got for Christmas! I followed this recipe for mini Oreo cheesecakes from Baked by Rachel, with two small adjustments. 1. I used 8 oz of Neufchâtel cream cheese (which has 1/3 less fat) and 4 oz of regular cream cheese. 2. After mixing together the cream cheese, sugar, and egg, I added in a lot of green food dye to make the cake art green. I say a lot, and I mean a lot. I didn’t want the green to be pastel-colored, and it took a lot of dye to make it this dark. I then added in the Oreo bits, so they wouldn’t just turn into Oreo dust from all the mixing. If I had more time, I probably would have printed out little footballs (found here) and made them into cake toppers. Oh well, maybe next year.